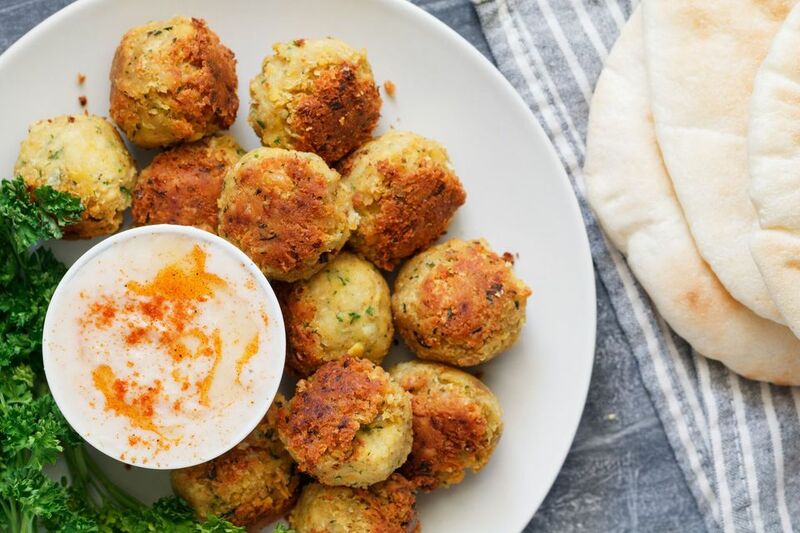 Falafel is a deep fried ball or patty that is made from chickpeas or fava beans and spices. It is a vegetarian food and is one of the most widely consumed and recognized foods of the Middle East. Falafel is very popular in the Middle East as a fast food. Vendors sell it on the street corners is most popular in countries like Israel, Egypt and Syria. It is regarded as a "fast food" and sold like hot dogs by street vendors. Falafel is also the national dish of Israel. As a main dish, it is served as a sandwich, stuffed in pita bread with lettuce, tomatoes, and tahini. As an appetizer, it is served on a salad, or with hummus and tahini. Most of the time served with hot sauce. Alternate Spellings: felafel, felafil, filfil, and felefel. Combine chickpeas, garlic, onion, coriander, cumin, salt and pepper (to taste) in medium bowl. Add flour. Mash chickpeas, ensuring to mix ingredients together. You can also combine ingredients in a food processor. You want the result to be a thick paste. Fry in 2 inches of oil at 350 F until golden brown (5 to 7 minutes). This recipe does call for 2 tablespoons of flour, however, if you find your falafel is falling apart you can use more. Just add a little at time. Egg is also an acceptable binding agent, but only use 1 egg. The sky is the limit when it comes to serving falafel. It is commonly served in pita bread with salad and tahini sauce or hummus, called a falafel pita. French fries are sometimes added in the pita with the falafel instead of vegetables. Falafel can be served alone and is often accompanied by hummus, baba ghannouj, fresh pita bread, fries, and a salad. McDonald's in Egypt serves the "McFalafel," a falafel version of the Big Mac. The secret sauce is replaced with tahini.